Tytus certainly have been paying attention to their heavy metal forefathers on “Rain After Drought”. Opener Disobey is melodic, majestic and clean sounding. There’s a lot of thrash-like percussive tempos and guitar work that go alongside the twin-melodies and solos. the vocals are also clean, though not too the point of being power metal in style. At times their music brings to mind Death Angel, which is no bad thing. They continue with the up-tempo gallop of The Invisible, which is an outstanding all-round metal song. It certainly seems more focused than the album opener, but not all bands hit their stride straight away. This bodes well for the rest of the record. 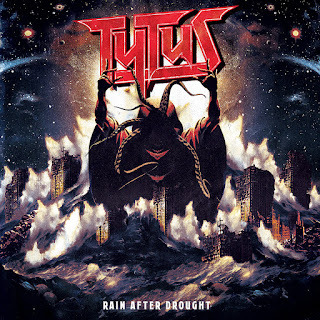 Tytus’s song-writing is more off-kilter on The Storm That Kill Us All, especially in the verses though these make the chorus sections even better. It’s classic in every direction and not too overweight in the playing-time department either, which seems to be a characteristic of their music. It’s over before you know it and is followed immediately by Our Time Is Now. The band’s full-scale attack keeps on coming and with it, more awesome solos and sing-along opportunities. The Dark Wave blurs the lines between heavy metal and punk in subtle ways. The tempos are there and so is the melody (I feel like I’ve been banging on about both of these too much already here). I guess there’s more of a hard rock slant to it. It’s still brilliant. Old-school thrash elements are the bedrock of Death Throes, which is a meaty song filled with yet more classy riffs. I don’t really know what else to say. By the time you reach this point on the record, you’ll know exactly what you’re getting with Tytus and will no doubt be hooked. If not, you’ve got no soul. Next up is the two-parter, starting with Rain After Drought - pt.1, which is the band’s longest song here and what you get is an instrumental piece that shows a different side to Tytus. There’s an obvious not to the progressive nature of many of their countrymen and women, as Italy is known for it’s theatrical and experimental bands. This is a bit a journey but in a good way. Rain After Drought - pt.2 is an altogether more bluesy number with superb clean singing. There’s a classic rock/ballad feel to it, which is definitely nostalgic. It’s followed immediately by the furious and urgent Move On Over, that gets the heart racing a bit more. As does album closer A Desolate Shell Of A Man. Tytus has shown that there’s still room for good old heavy metal in 2019 and the genre that was built stronger by Metallica, Megadeth and Iron Maiden is well and truly in safe hands.